Kola Owolabi, associate professor of organ at the University of Michigan, Ann Arbor, plays these quintessential French baroque pieces by Jacques Boyvin (ca. 1653-1706) on the beautiful organ built in 1732 by Andreas Silbermann (1678-1734) for the Abbey church in Ebersmunster, France. The organ incorporates stops and sounds expected by composers of organ music in France during the 17th and 18th centuries, and thus specified in the music by Boyvin. Andreas, working in Alsace with strong French and German influences, also included certain Germanic capabilities in the organ at Ebersmunster, as well. Andreas Silbermann was the elder brother of Gottfried Silbermann (1683-1753) who became the famous organbuilder known personally to J. S. Bach. Gottfried learned organbuilding from his older brother in Alsace. In searching for the organ on which he would record these 26 works by Boyvin (the works set in suites of six to eight pieces each), Owolabi writes, ". . . my choice of [this] organ might be surprising to some, due to its Alsatian characteristics that show both French and German influence. However, the sound of this instrument has an expressive beauty that really charmed me." 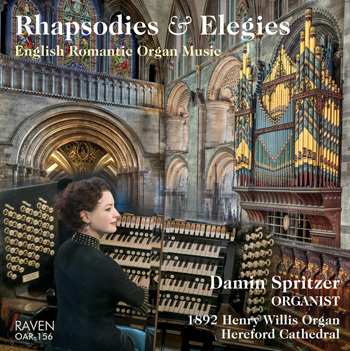 The CD booklet includes an essay on choosing the organ for the recording, other organs auditioned, and also an extensive essay on Boyvin and the registrations the composer directs for these pieces. Registrations used in the recording are also included, as is a brief history of the organ by Marc Baumann, titulaire of the church, the organ stoplist, and photographs. Recordings featuring the music of French composer/organist Jacques Boyvin (1653-1706) are few, with some mixed collections containing one or two of his pieces, and recordings devoted solely to his music are rare. I believe there is only one disc on the market right now that is all Boyvin, so it's nice to see once again the people at Raven extending their prolific organ music catalogue by releasing an all Boyvin CD featuring the Four Suites form the Second Organ Book. Jacques Boyvin precedes Johann Sebastian Bach by 30 years and thus is more in line chronologically with Buxtehude and, not surprisingly sounds about the same. Most pieces are written in two, three and sometimes four parts, with fugues worked out more in canonic form similar to Buxtehude, and far from being extensively developed like the later offerings by Bach. And of course, like all French music from the Baroque period, it is highly ornamented and brighter in temperament than the austere and disciplined music of the German Kapellmeister. "Despite the fact that these Suites were composed for use within the liturgy of Roman Catholic masses and vespers, Kola Owolabi's playing is always characterized by an attention to their unfussy and uncluttered style. Apparently Boyvin was quite specific when it came to the registration of his pieces, and it seems that Owolabi's choice of instrument and its range of stops, work hand in hand to generate the proper sound befitting each piece's distinctive character. Some of them, when allowed to project this organ's beautiful mellow flute stops, even brought a smile to my face. "The extensive booklet notes which cover everything concerning the composer, the organist, the history of the organ and its range of stops, all help make this recording a must for any pipe organ music enthusiasts, and/or any music fans in general for that matter. Music not often heard always freshens the listening experience and adds perspective to everything else. "